Having considered the attacking and defensive phases of the game, we are now going to focus on set pieces. Please take some time to think about how you approach set pieces with your team and feel free to record this in your document for your own records if you wish to do so. Ted Knutson – owner of StatsBomb Services, has experience in seeking competitive advantages for football clubs across a wide range of areas, including set pieces. Here he gives insight into his experiences dealing with clubs, and below are two articles he wrote talking about how many in the football industry approach set pieces. 21st club have also highlighted set pieces as a potential undervalued area of the game in their piece below. Their research found that team strength in open play had no relationship with set piece strength. In effect, it’s just as easy for weak teams to dominate on set pieces as it is for good teams. Set pieces aren’t just limited to corners of course, at the Opta Pro Forum in 2015, Dan Barnett researched potential team strategies for whether to cross or shoot from free kicks in certain areas of the pitch. Jarred Young also investigated strategies from goal kicks for American Soccer Analysis. We’re now going to complete a task on set pieces which is also included in our Opposition Scouting & Analysis course. If you have already taken this, you may skip the task, or re-take it in order to jog your memory on the potential power of leveraging set pieces. Please view the .pdf file and download the excel spreadsheet below. The final video in Module 7 shows some of the routines employed by New York Red Bulls during the 2016 season. If you’ve seen enough and want to purchase this course, please use the button below! 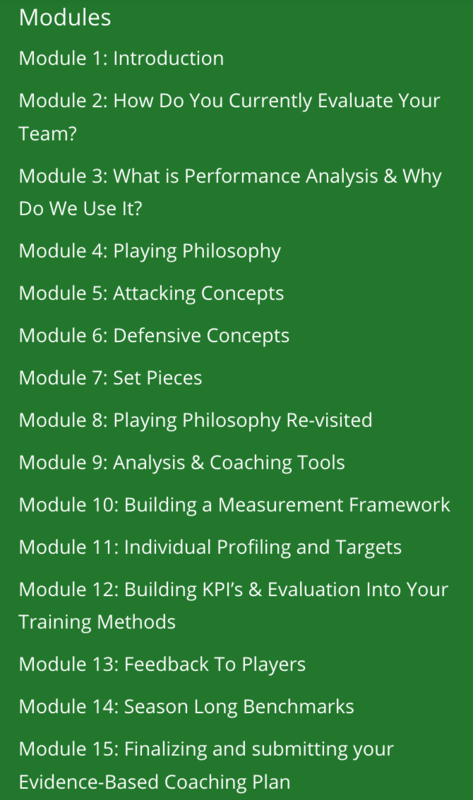 For the second task in Module 7 please record your thoughts on set pieces in your course document as well as the comments section below. Do you have any interesting set piece articles or videos you want to share? Have you been punished from or scored a set piece in an important game? Once you have done this, please move on to Module 8.